it imparts understanding to the simple.” Psalm 119:130, English Standard Version (ESV). Thank you for joining us, as we prayerfully continue the Feast by reading Deuteronomy Chapter 28; “The blessings for obedience. (1-14) The curses for disobedience. 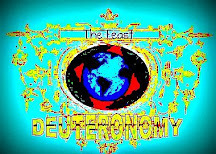 (15-44) Their ruin, if disobedient. (45-68)“ – Matthew Henry Concise. God makes it a very simple matter to choose between following Him (blessings); “1 “And if you faithfully obey the voice of the Lord your God, being careful to do all his commandments that I command you today, the Lord your God will set you high above all the nations of the earth. 2 And all these blessings shall come upon you and overtake you, if you obey the voice of the Lord your God. 3 Blessed shall you be in the city, and blessed shall you be in the field. 4 Blessed shall be the fruit of your womb and the fruit of your ground and the fruit of your cattle, the increase of your herds and the young of your flock. 5 Blessed shall be your basket and your kneading bowl. 6 Blessed shall you be when you come in, and blessed shall you be when you go out.” Deuteronomy 28:1-6, ESV. Or not loving and following God (being cursed); “15 “But if you will not obey the voice of the Lord your God or be careful to do all his commandments and his statutes that I command you today, then all these curses shall come upon you and overtake you. 16 Cursed shall you be in the city, and cursed shall you be in the field. 17 Cursed shall be your basket and your kneading bowl. 18 Cursed shall be the fruit of your womb and the fruit of your ground, the increase of your herds and the young of your flock. 19 Cursed shall you be when you come in, and cursed shall you be when you go out.” Deuteronomy 28:15-19 ESV. God wants you to succeed so much that He sent His Son, Jesus to pay for all of your sins; “16 “For God so loved the world, that he gave his only Son, that whoever believes in him should not perish but have eternal life.” John 3:16, ESV. You can’t buy or earn this gift from God; “8 For by grace you have been saved through faith. And this is not your own doing; it is the gift of God, 9 not a result of works, so that no one may boast.”, Ephesians 2:8-9 ESV. I know what God’s will is for us; ”9 The Lord is not slow to fulfill his promise as some count slowness, but is patient toward you, not wishing that any should perish, but that all should reach repentance.” 2 Peter 3:9, ESV. I’m in how about you? I send the Feast out as the Holy Spirit inspires me. If the Lord Is willing I’ll send and post the Feast again tomorrow.